This elegant eating knife and holder offers a small glimpse into the lifestyle of the Mongolian nobility in the nineteenth century. The holder comprises seven hand-cut hollowed-out jade segments enclosed within a silver casing. 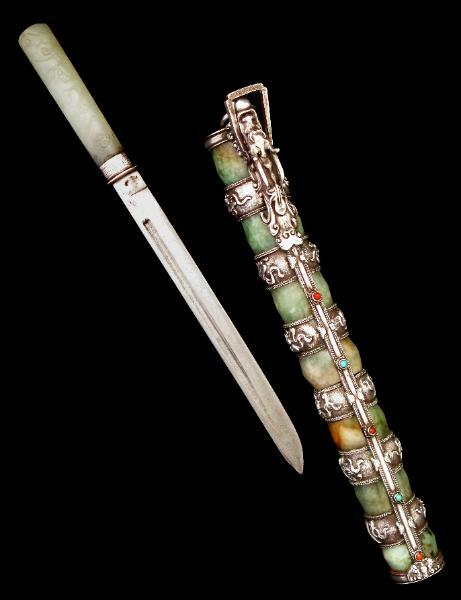 The jade segments are separated by six bands of silver chased and repoussed with flowers and various Taoist and Himalayan motifs. They are connected to one another by a silver band inlaid with coral and turquoise. One end of the band terminates in a bat motif in silver relief. The other end terminates with a magnificent cast and chased snub nosed dragon. Wedged in the dragon’s mouth a silver ball or pearl through which is a ring that allowed the knife to be suspended from a belt. A rectangular, engraved loop which is attached to either side of the dragon also facilitates suspension. The ends of the holder are enclosed by bands of silver. The blade of the knife is made from steel. 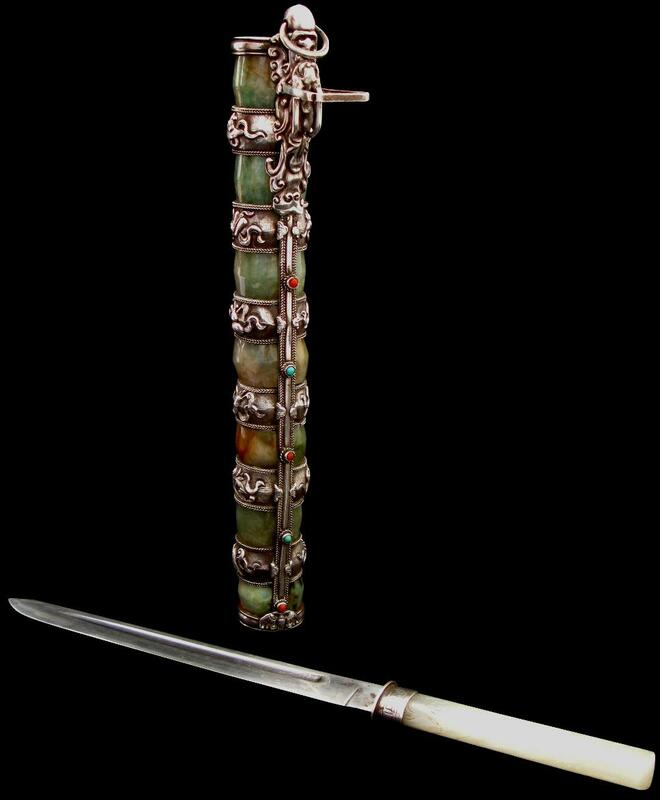 The handle is of a single piece of evenly coloured pale-green jade that is engraved with bats amid stylised clouds. The top of the handle is rounded and further engraved with a seal in stylised Mongolian and Chinese script. The blade and handle are joined by means of a silver band engraved with a continuous key-fret pattern. The overall condition of this magnificent knife set is superb; there are no losses, chips or dents and the silver, the blade and the handle all have a gentle age-related patina. Body, Speech and Mind: Buddhist Art from Tibet, Nepal, Mongolia and China, London, December 1998. One more was offered by Christie’s London in their ‘Important Islamic, Indian and South East Asian Manuscripts, Miniatures and Works of Art’ sale, October 11, 1998, as lot 130. Christie’s attributed their example to 19th century Tibet. ATG Outstanding Item Award for 2008.